There are a few reasons that this issue may occur. On some occasions, you may set up your availabilities for services and staff members in ways that don't necessarily add up. The first thing to check for is whether the available dates and times for services and/or staff members are set up accordingly. Since EDD Bookings allows you to assign timezones to both services and staff members, you may inadvertently have an inconsistency across timezones. Please confirm that the timezones you have set up are correct, and that the timezone selected in the booking form (if enabled) is the same as your service or staff timezone. Once you have done this, if the calendar still shows no available dates and times, it's time to look into the possible cron job issues below. It is often the case that your cron jobs are either stuck, blocked, or not scheduled properly. 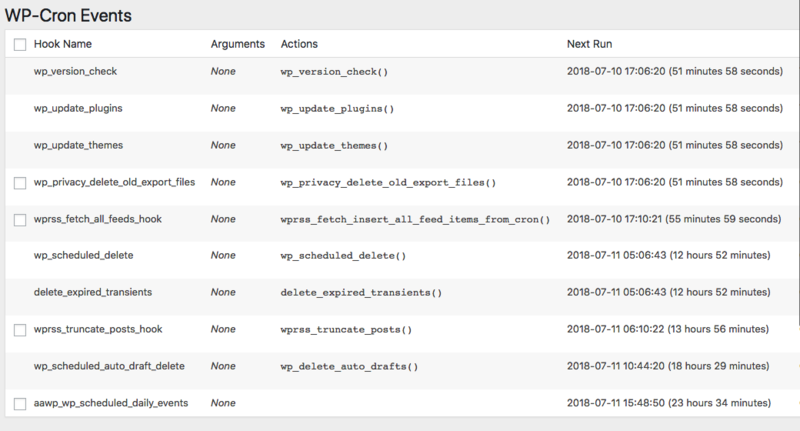 We recommend using the WP Crontrol plugin to monitor your cron jobs. It allows you to view your cron jobs from your WordPress admin by going to Tools > Crontrol. The first thing we recommend is checking if there are cron jobs at the top of the list that are stuck, but should be running (marked as “now”). If after waiting for some time, or after multiple page refreshes, it still does not run (shows a time rather than "now"), then the cron job is stuck. There are three possible solutions for this. Navigate to http://yoursite.com/wp-cron.php from your browser (replace “yoursite” with your domain name). After a while, you should see a blank page. Go back to Crontrol to see if the cron jobs are running as they should be. $args['args']['timeout'] = 1; // Seconds. Increase as needed. This setting can be different for different server configurations or network loads. Be aware that increasing this can generally slow down the site. Paste the code above into the Code section. Once this is done, go back to your services, open them, and hit "Save" again. Do the same for Staff Members. This gets the plugin to generate the available sessions again. Now go back to your booking form and check if the calendar shows any dates and times as available. WARNING! Be careful when editing your wp-config.php file through WordPress. If you mistype something, your site could potentially crash. It is not recommended to use this option if you are unsure of what you are doing, but if you do know what you're doing, it is recommended to use FTP access to edit such files while keeping local backups, so you can easily and quickly undo any changes that may have caused errors. Speak to your hosting provider. Since cron jobs are part of the server-side of your site, your hosting company is in the best position to help you figure out why the cron jobs are stuck, as well as fix them.